The Data Administrator offers a convenient way to set the user access and cost centres for the respective Develop system. However, its functions are not just limited to restricting utilisation of the system and certain functions (printing, copying, scanning, faxing and BOX). In addition, it is also possible to define quantity restrictions for individual users or projects. User addresses can be read in from tables or can be imported directly from an existing address database. Public users can be allowed to perform b/w copying only without assignment of an access code. The Data Administrator standard software is suitable for all ineo systems with a printing speed of at least 25 pages per minute and is available on user/driver CD and at hear. Multi-functional colour systems support the introduction of new functions and therefore create value. However, these increased options also mean increased usage. 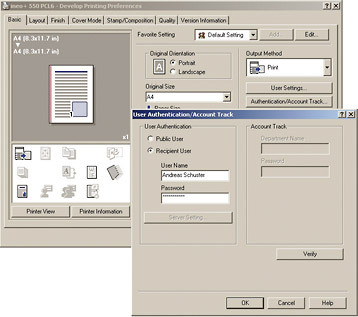 Add confidential data to the mix, and you have a situation where usage control is required. The Data Administrator offers a convenient way to set user access and cost centres for the respective Develop system at a PC.